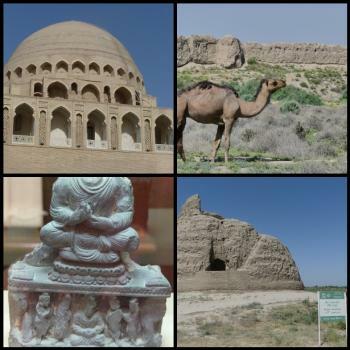 Ancient Merv was a major oasis-city in Central Asia, on the historical Silk Road. Several cities have existed on this site, which is significant for the interchange of culture and politics at a site of major strategic value. Merv is such an extensive site that I don't know how I would have visited it on my own. Probably hire a taxi and be transported from location to location. The thing about Merv is that it holds the archeological remains of 5 cities, built next to each other during different periods in time. There's a small museum near the entrance where a model of the total area can be seen, and how the different cities are positioned. First real sight in the park is the Mausoleum of Sultan Sanjar. It has been almost completely restored with the help of Turkish funds. This is the building that you will see in the distance over and over again from different corners of Merv park. Next stop is at the "Forbidden City". These are just remains of walls. We can go on / in it, without being limited to certain paths. Our obligatory Turkmen guide only is a bit worried about stray dogs (we didn't see any). On the ground lie lots of bits of coloured tiles. The Turkmen authorities haven't even begun proper excavations here. The Erk-Kala is the oldest city ruin. Nowadays it is 'just' a large hill (somewhat like a tell?) on which you can climb and look out over the adjoining little oasis. At Gyaur-Kala only some walls remain. Our attention here is mainly drawn by the resident camels that are roaming around in this part of the park. Finally we go to Kiz Kala, the remains of two palace fortresses. These are still quite intact. Also some of the original architectural features of the interior can still be seen. Merv is so large that you will not encounter many other people at most of the spots. Busiest is the mausoleum of Sultan Sanjar, especially popular by local visitors so it seems. I visited this WHS in June 2017. The inscribed areas include vast stretches of semi desert land stretching from a few kilometres away from modern Mary (the Archaelogical Site of Ancient Merv) to a very long day trip some 60km away from Merv on terrible roads to Togoluk and Gonur Tepe. The Archaeological Site of Ancient Merv is made up of different sites (top photos) relatively close to each other and with roads and small parking areas near each site. On the other hand, the sites of Gonur Tepe and Togoluk contain the remains and impressive foundations of whole settlements on an area of around 55 hectares. Most remains in the Local History Museum of Mary and in the National Museum of Ashgabat came from the these two sites. Gonur Tepe is among the largest ruins in the Morghab delta region with over 150 ancient settlements dating to the early Bronze Age. Moreover, Buddhist remains were also found here (bottom left photo). If you have an extra day in Mary, go for this worthwhile day trip, otherwise just focus on the closer sites. Apparently the lead archaeologist has passed away and further excavations are at a standstill. It is a recurring theme in all Turkmenistan's WHS and you feel as if you're trespassing in an archaeological site which is still being excavated (hopefully!). In the archaeological site of Ancient Merv, the main highlight for me was the 12th century Great Icehouse (bottom right photo) as I had never seen anything like it. Old photos in the National Museum of Ashgabat show that the remains of Ancient Merv were much higher before the earthquake and in a more preserved state. Some sort of ancient construction technique was used to deter insects and birds from destroying the mud constructions. Unfortunately, when these sites were restored this repellent effect was lost and now insects and mostly birds are damaging the remains. All in all I felt that this site deserved its place on the list and even though it's hard to grasp its OUV without the remains in the museums, I enjoyed my visit. Those travellers who have followed the Silk Road will have become used to restored cities – Bokhara, Samarkand and Khiva in Uzbekistan. And very fine they are too. But if you venture south to Turkmenistan and visit Merv it is a very different sort of experience. This 100 square kilometre site contains the remains of at least 5 different cities dating from the 6th century BCE through Alexander the Great and the Persians to the Seljuk Turks. At which point it was totally destroyed by Jenghiz Khan in 1221. The newer cities were built alongside (rather than “over” which is the norm in most continually inhabited sites) the old and all used mud bricks. So what you see is a jumble of walls, earthworks and misshapen buildings as they succumb to the elements. If you are there you must have overcome the labyrinthine bureaucracy of Turkmenbashi (“Father of the Turkmen”) to get a visa. Indeed you will already be totally overwhelmed by his cult of personality – the gold statues, the photos, the books, the carpets with his picture on, the marble palaces, even his gold monogram in the corner of every TV program as it spouts again the details of this magnificent cotton harvest or that world class factory. So see Merv as an antidote – a reminder of temporal nature of states whatever their politics and whoever their leader! All will be dust one day. If you have obtained a visa you will probably be travelling with a guide and, unless you have great knowledge or a wonderful imagination, a guide is really needed in Merv as mud wall succeeds mud wall. He will also have got you through the interminable and frequent road checks needed to travel from Ashgabad to Mary, the Soviet city near to Merv, where you will probably have spent the night before driving on for the last half hour. You will also need a car to get round the site – the distances are enormous. 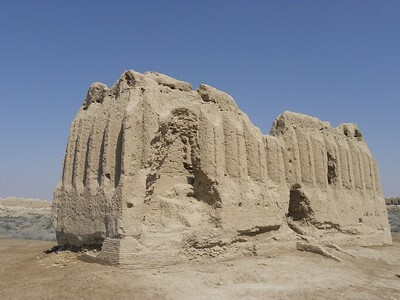 Among the surviving buildings are the remains of a 7th century fortress known as the Kyz Kala (see photo). Another major building, which has been significantly restored is the 12th century Mausoleum of Sultan Sanjar. Whilst this latter might represent a pinnacle of Islamic architecture for its simplicity it tended in my mind to become just another “domed mosque” on a journey of domed mosques. It was the, altogether more elemental, Kyz Kala which seemed to me to best capture the atmosphere of the ruins and which I remember when I think of Merv! Icehouses: Locations 886-015, 016 and 017 1st, 2nd and 3rd "of three icehouses"
Abbasid Caliphate: AB: "Numerous major events and personalities of historic importance have been associated with Merv. These include Abu Muslim, who initiated the Abbasid revolution..."
Alexander the Great: Known as "Alexandira Margiana" See link. Also from the Nom File - "The oasis formed part of Alexander the Great's empire, and Pliny (NH VI, 16-17) suggested that the Hellenistic city was founded by Alexander". Built in the 5th century BC: The succession of cities, which together once encompassed over 1000 ha, date from the 5th century BCE to the present day. The first city was Erk Kala. Former Largest Cities: Around 1150 A.D.